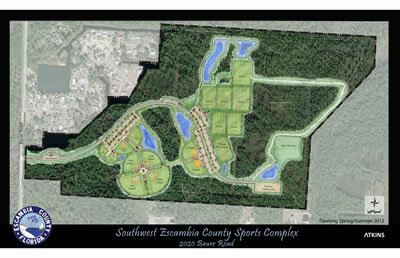 The SW Sports & Soccer Complex boasts six full sized soccer fields and one multi-use soccer/football field. The complex is the newest athletic complex in the county and the fields are maintained by PBFC at the highest of standards. Three fields are currently lit and the others are prewired for future lights. A first-class concessions stand and bathroom facility is fully air-conditioned and heated and the soccer park also has two expansive pavilions to provide shade, a place to eat and somewhere to sit and visit with parents and kids. We hope that future facility expansion will include the completion of the athletic field lighting, a locker room, and office facility for our ever growing soccer operations. The Baars Athletic Field Complex is the original sports complex in Perdido that was initially designed for baseball. It was actually the location where the Perdido Soccer movement was initially born as the first few years of Perdido Bay Youth Soccer was played on the outfields. The facility is no longer utilized for baseball and recent facility changes have opened the complex up to use as a soccer friendly facility. This facility is utilized for PBFC practice overflow, meetings, and storage. We look forward to expanding our operations at Baars Athletic Fields and working with the Escambia County Parks & Rec to restore the facility to something that the community can be proud of.